The AMP® ConicaPro™ Path & Area Light (Lamp-Ready) features cast brass construction, adjustable lamp position, and lifetime warranty. Socket accepts AMP® G4 LED lamps. 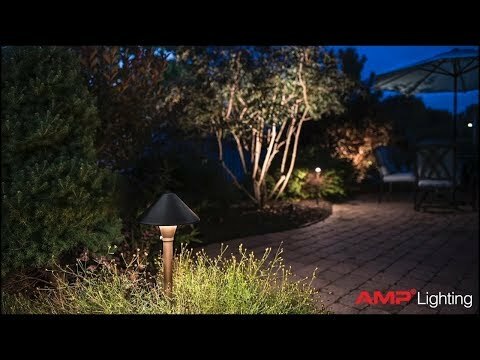 The AMP® ConicaPro™ LED Area/Path Light (Lamp-Ready) features durable cast-brass construction to resist physical and chemical challenges in the landscape. The fixture’s appearance is simple and organic. A replaceable G4 LED lamp serves as the light source. The light level and spread can be adjusted by raising or lowering the fixture body. This fixture is an ideal choice for high traffic applications and will maintain its appearance for the life of the landscape. Durable cast brass construction that prevents physical and chemical damage - suitable for high-traffic applications. Choice of two high-quality G4 LED lamps for design flexibility. Adjustable fixture body height to expose more of less of the LED lamp - allows designer to increase or decrease light level and spread. Entire Fixture (top to ground) 23" x 6.9"